Kids Birthday Cakes | Create birthday cakes that ROCK! Create birthday cakes that ROCK! 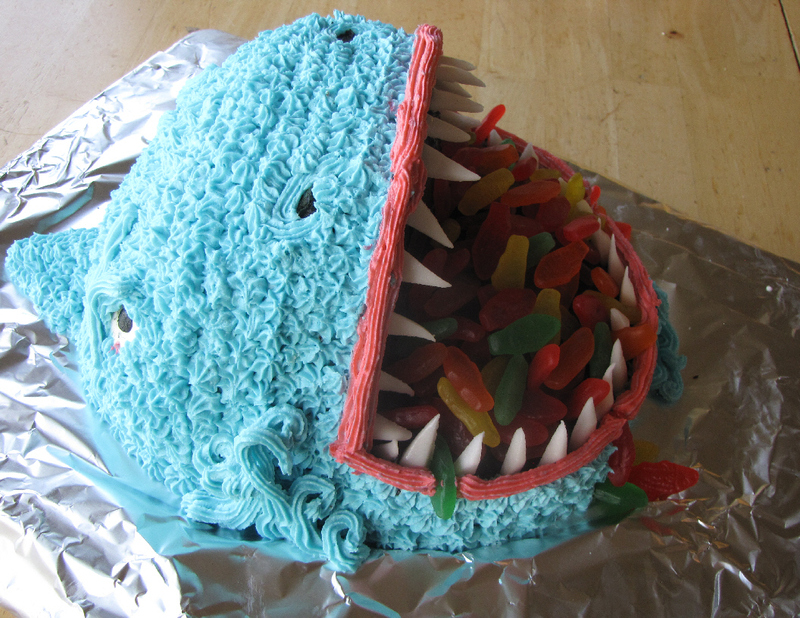 This shark cake totally came out of the blue when a friend of mine asked me to do a simple shark cake with easy to follow instructions for her son’s birthday party. I did some research on the different shark cakes out there and came up with a design using two 8 to 9-inch rounds. I decided to focus on the head and not the body to make it simpler, plus the mouth is where the action is with a shark—with menacing teeth and a school of colorful fish filtering through. For this cake you will need 1 cake mix, about a cup worth of colorful Gummi Fish, two small packages of White Surprise Flavor Airheads, some Black Cake Mate Frosting (comes in a tube in your cake aisle at the grocery store) and one recipe of Buttercream Frosting (see the frosting tab above). First bake your two rounds and remove from pans when cooled. 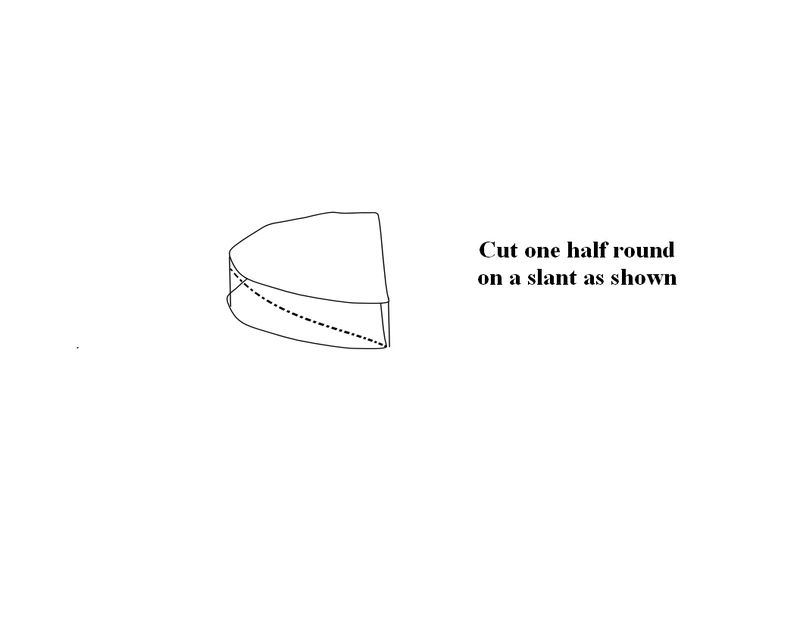 Cut each round in half and then. 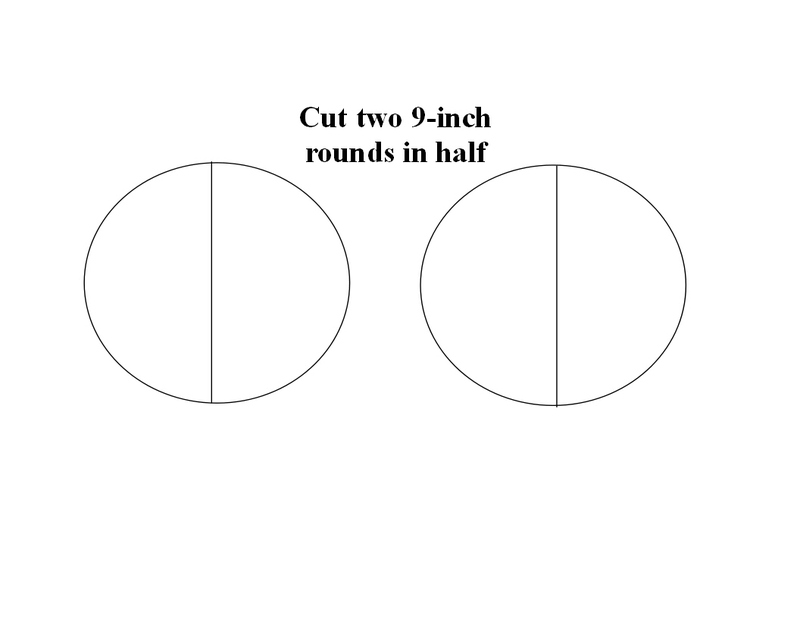 Cut one of the half rounds at a slant as shown in the second diagram. Take the bottom portion of this cut and flip it over for the left bottom of the shark’s mouth. Reserve the upper portion for later. You will place the second half of the first round that you just cut on the bottom back of the shark head as a base for the vertical parts. 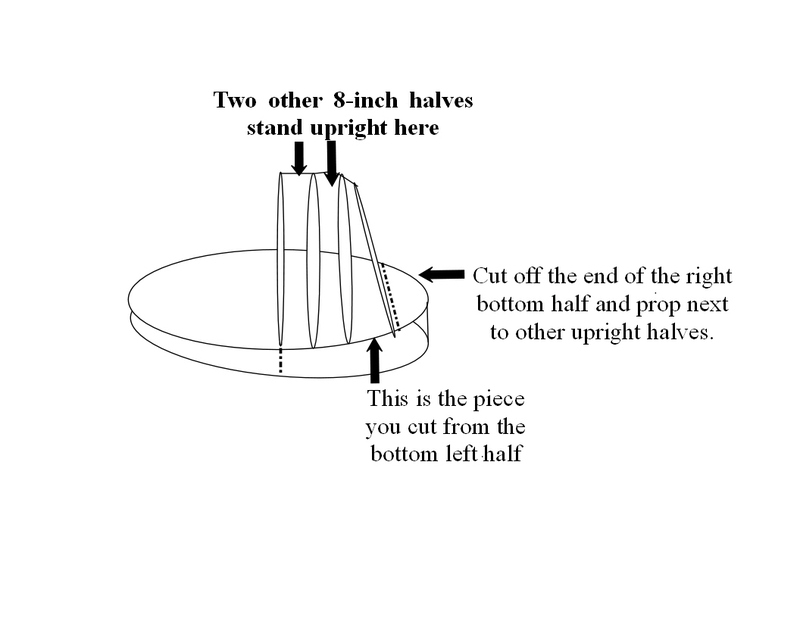 Stand the first half of the second round vertical as shown below and prop the next half next to it, per the top instructions. Next, add the reserved diagonally cut portion and prop it next to the other tow haves. Then, cut off the end that remains according to the dotted lines below. Prop this upright, vertically on the end. Make the Buttercream frosting and reserve ¾ cup for later. Tint the rest blue. Freeze the cake for at least one hour. Remove the cake from the freezer and crumb coat the outer parts of the head with blue frosting everywhere. Remove after about one hour. Use the frosting from the Black Cake Mate tube to frost the inside of the mouth. I use my cake spatula, dipped in hot water to get this as smooth as possible. Take out about a teaspoon of white Buttercream and add extra powdered sugar until you can roll the frosting into a ball. Cut this in half and roll two more balls of frosting and place as eyeholes about six inches back from the mouth and 3-4 inches from the base of the cake. Tint the rest of the white frosting pink and pipe a line of pink around the mouth to give a nice edge to the mouth. I used a star tip. Use the piping bag, filled with blue frosting to pipe stars around the head. I created eye lids by drawing a heavy lid over the tops of the eyes and then used another line to draw a mad eyebrow above the eyes. Pipe around these additions and add more lines if you want more of the eye or brow to stand out. Cut the White Airheads into slim triangles for teeth and place them along the outside of the pink frosting mouth line. 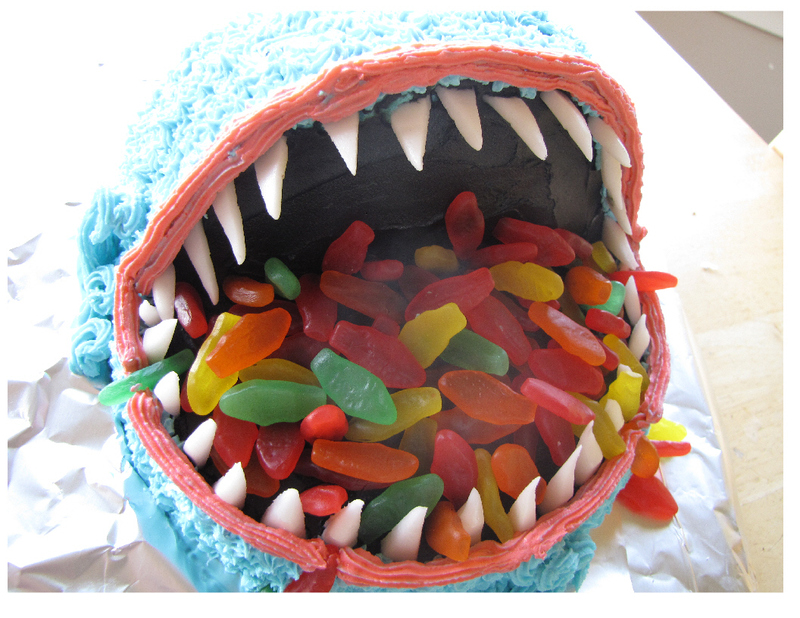 Add the Gummi Fish overflowing from the mouth. Preheat oven to 350 degrees. In a medium sized mixing bowl, cream together the shortening, sugar, eggs and vanilla. Blend any bottle or can of fruit of your choosing in a blender (can be blended fine or left with some larger chunks, too) and add it to the first mixture. In a separate bowl, mix together the dry ingredients (the remaining ones) and then add the dry ingredients into the original creamed mixture. 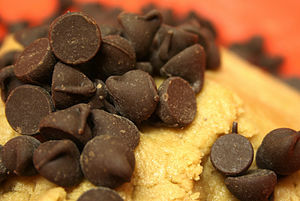 You can mix in 1- 1 ½ cups of chocolate chips at the end and then spread it into a 9×13 greased pan or Pyrex. Sprinkle the top with 1/3 to ½ cup of brown sugar and add a few chocolate chips on top or chopped walnuts or pecans to your taste. Raisins can be used instead of chocolate chips or along with them. Bake for 35-40 minutes.